Wigtown & Bladnoch v Newton Stewart'Robert Jamieson of Wigtown heads past Newton keeper Euan Drysdale to make it 2-0. Derby Day in Wigtownshire usually means a tight game and a lot of rivalry and today’s game did not disappoint! The game saw Wigtown attack hard and fast with an Robert Jamieson heading home after being found by an Ian Miller corner after just 10 minutes to open the scoring. After 15 minutes, Miller attacked up the left wing before finding Blair Dougan with a cross at the back post but the header was well saved Newton goalie Euan Drysdale. Just a minute later, Miller found Jamieson with a pitch perfect cross and the striker headed home to make it 2-0. 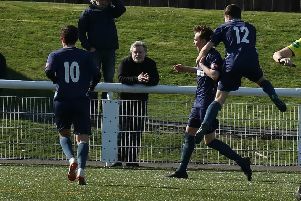 Newton started to attack more following this goal and had three corners in the 10 minutes before Robert Middleton headed home a free kick for the visitors after 35 minutes. Wigtown restored their 2 goal lead just 5 minutes later as Dougan was fouled in the box and Miller made no mistake with the resultant penalty, sending the keeper the wrong way making it 3-1. The second half started as the first had ended with the game getting more even as both teams saw chances. On 69 minutes, Wigtown could have made it 4 as Miller took a quick corner finding Rab Joe Paisley, but the substitute could not get his header under the bar. 6 minutes, some good play from Newton saw Martyn Henry get the ball and score making it 3-2. Chances in the last 15 minutes were few and far between as Wigtown sat in to defend and keep their lead and 3-2 was how it would end to take the hosts 10 points clear at the top of the league! Wigtown team: Martyn Roddie, Tyler Rennie, Lewis McIntyre, Lewis Richardson, Mark Whorlow (off for Chrissy Chilton), Blair Dougan, John Lowe (off for Thomas Garrett), Richard Jones, Ian Miller, Lewis Dunn & Robert Jamieson (off for Rab Joe Paisley).